Our last show was a record setting advance sell out and tickets for this show are on sale now! Don’t miss it, get your tickets now! Advance tickets are just $26.00. 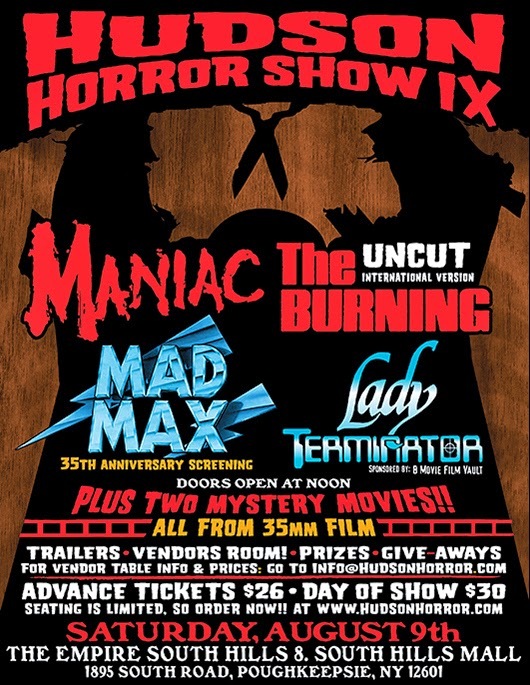 Click here to order at HUDSON HORROR/PURCHASE TICKETS. If any tickets remain the day of show, they will be available for $30.00, cash only. But don’t count on it! As always we’ll have vendors selling toys, DVD’s, t-shirts and all other merchandise. If you are interested in being a vendor, or if you have a question about the show, shoot us an email at info@hudsonhorror.com. Keep watching our website and Facebook page for more info and we’ll see you Saturday, August 9th, 2014 for Hudson Horror Show 9!